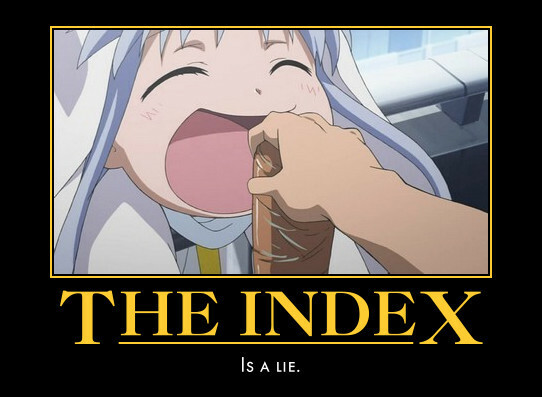 Crunchyroll - Forum - The Anime Index? With the the change of CR, I really hope they update the CR anime index. Right now it is about 100% useless as over 80% of the series listed is gone. Also only about half of the new videos coming out currently support the 720 resolution, the other half support only 480p. They should really think about categorizing the index with up to date series list and maybe mark what the best avaliable quality for that series is. As CR stands today, it is very hard to find what new animes have been added for the "premium usage" Except for bigname titles like naruto, and a few others. Everything is kind of a mess. Hope this will be cleared up soon? I agree its not too big of a deal, but it can get a little confusing. yeah... but im not really bothered by that though.. if i cant watch an anime here, i try other sites.. when im done with that series, i go to the next one on my list, if its not available here, ill just watch in in another site.. I wish they would just put the anime that is available and not those with no videos. We asked for more fish, and they wouldn't give us any more fish. Thank you for making a topic on this. I wanted to make one, but don't have enough crunchyroll points so I ended up posting in the site suggestion thread, where it will of course end up lost amidst a sea of other random issues. Seriously, this is a bait and switch as far as I'm concerned. If you must, split the index page into 2 sections, one for "currently viewable" and another for "no video content available" and perhaps even a 3rd section for "confirmed completed/up to date"
As it stands, the anime index page has some 2000+(possibly 3000 - 5000 range) of anime. There is something less than 100 of those that are now currently available. That is bordering on bait and switch. Come on shinji, I am totally in support of crunchyroll actually becoming an actual legitimate internet anime portal, but god D***it, you had plenty of time to let people know that you were going to be switching to publisher only uploading, so why the heck couldn't you have devoted half a day to putting in a quick conditional that lets the index page only display those anime series that HAVE VIDEOS! Heck, I realize that it probably wouldn't be that easy, but this should have been one of the FIRST things you update, not something that is only done as an afterthought.